Simple wedding vows, whether you write the vows or recite someone else's creation, are a quick and sweet way to declare your love for your spouse during your wedding ceremony. Because they're simple, they'll be easy to remember, even when you're a bundle of nerves on your big day. "Do you take (name) to be your wife?" "Do you promise to love, honor, cherish and protect her, forsaking all others and holding only unto her?" "Do you take (name) to be your husband?" "Do you promise to love, honor, cherish and protect her, forsaking all others and holding only unto him?" "I (name) take thee, (name), to have and to hold, in sickness and in health, for richer or poorer, to love and cherish, from this day forward until death do us part. With this ring, I thee wed."
You can find more simple vows at websites like My Wedding Vows, where you can get ideas for your own and Wedding Paper Divas, where you can find over 600 vows for free. Simple doesn't have to mean vows that are not original, so if you want to use your own words to profess your love for your spouse on your wedding day, you can make the speech as simple or flowery as you like. You may feel uncomfortable pulling out the notecards in order to remember what you wanted to say during the ceremony, however, so come up with words to express how you feel in a way that you'll remember at the altar. My Wedding Vows helps you build your own vows if you need a nudge in the right direction. 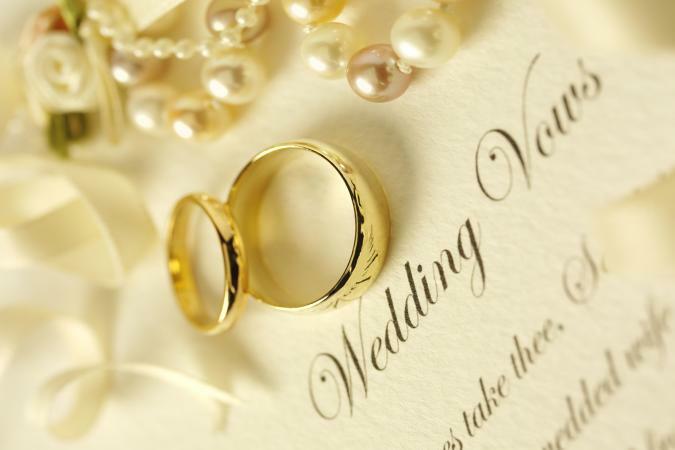 You can also build upon the more traditional vows, interjecting or changing phrases here and there in order to make your wedding vows personal, yet still easy to memorize. Attempting to express what your partner means to you in such a profound way in front of a crowd of people is enough to give anyone writer's block. If you're having trouble getting started, ask a best friend for pointers. She'll know a lot of the things that make you special as a couple and you'll be able to draw from those to create your own simple, yet modern and meaningful, wedding vows. "Take thee" can be "choose thee"
"To have and hold…" can be "To grow with and nurture, appreciate and love, to laugh with and cry with…" This is the sentence where you can really pour your feelings out for all to hear without changing the simple wedding vows around too much. They'll be recognizable as traditional, yet personalized for your marriage. You can always start from scratch and write a paragraph or even a song straight from the heart that sounds nothing like the traditional vows. Beware - there may not be a dry eye in the audience or at the altar if you go this route! Wedding vows - even simple ones - express so much, whether you go with the pre-scripted traditional vows or create your own completely. Even tweaking the vows that seem to be used in every wedding scene on television and in movies will tug on the heartstrings of everyone present. Just be sure that if you veer too far off the traditional course you've got a method for remembering what you want to say. What seems simple when you're writing it may flee from your mind when nerves take over on the big day.